Wire's RaidKiller addon will help prevent you from killing your raid using subtle reminders when encounter mechanics occur. Scroll Bars, Scrolling Lists and Dropdown Lists! Updated and added many mechanics! Wire's RaidKiller currently supports all instanced 10 and 20 player content, with limited support for 5 player content. Install and you're good to go! Type "/rk options" or left-click the "Gravestone" icon labeled "RK" to open the "Options" window. The "Gravestone" icon is an application pin and will be visible on-screen at all times. You can drag and drop it anywhere on the screen, then lock it into place by right-clicking. This pin also serves as an active encounter indicator. It will turn red only when you are currently engaged in an encounter and will be grey otherwise. "/rk stacking" will toggle timer stacking "Up" or "Down"
The "Mechanics" page of the "Options" window allows you to browse through mechanics by content type, zone and encounter. Mechanics rely on specific triggers during encounters, allowing on-screen actions to be performed as a result of certain events. Buff, cast, speak, notification, engage, percentage and timer triggers are currently supported. Specific mechanic triggers are hard-coded per enconter and cannot be modified. Mechanic descriptions generally indicate what event that mechanic is triggering from. Click the "Color" box for each action to open a "Choose Color" dialog. Use the sliders to select the color you want, then click "Ok" to save. Clicking "None" will save the default color settings instead. Enable an action by clicking on the red "Disabled" check box. Disable an action by clicking on the green "Enabled" check box. Test all enabled actions for a mechanic by clicking the "Trigger" button. If a mechanic features a "Flash" action, your screen frame will flash momentarily when that mechanic is triggered. This function is designed to get your attention and usually indicates that you should perform some action. 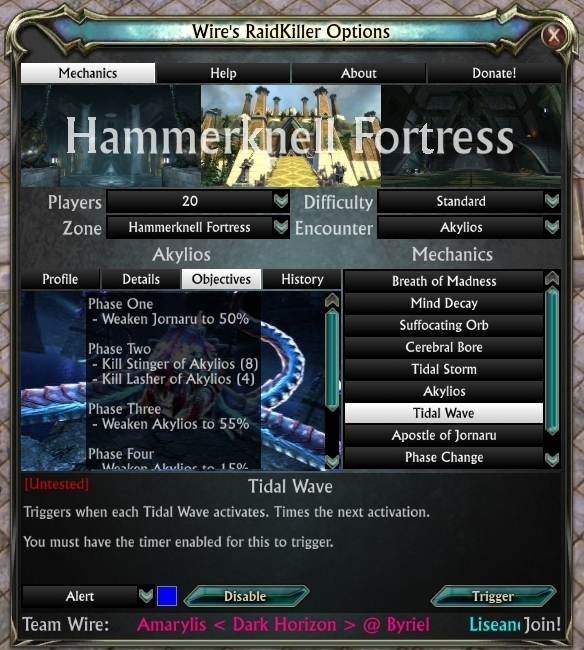 If a mechanic features a "Timer" action, a timer will appear under the "Wire's RaidKiller Timers" cascade bar when that mechanic is triggered. Timers count down time remaining, filling up from left to right. Timers are removed when they expire. Left-click a timer to deactivate it. Drag and drop the yellow "Wire's RaidKiller Timers" bar anywhere on the screen. Right click the bar to lock or unlock its size and position. Use your mouse wheel while hovering over an unlocked bar to change its size. Locking the bar will hide it until hovered over. Unlocked timers will adopt the current size of their parent bar and will cascade below it when they appear. Individual timers can also be moved, resized and locked independently. Use the "/rk stacking" command to toggle whether timers cascade above or below the cascade bar. Untested mechanics have their actions disabled by default. These mechanics //should// work most of the time, but cycle times and triggers may be slightly off. This is why they are disabled until they can be verified. Feel free to enabled untested mechanics and see how they work. Detailed feedback is appreciated. Wire's NPSee Addon has its own project site. Check out the details at RiftGame.com, Curse.com or RiftUI.com. "/nps stacking" will toggle target gauge stacking "Up" or "Down"
"/nps pvp" will toggle NPSee's PvP display "On" or "Off"
"/nps pet" will toggle NPSee's pet display "On" or "Off"
Whenever a hostile unit becomes the target of a member of your raid, a target gauge will appear under the "Wire's NPSee Targets" cascade bar. Target gauges are removed when the unit dies or is no longer targetted by anyone in your raid. 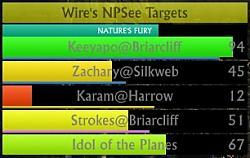 Drag and drop the yellow "Wire's NPSee Targets" bar anywhere on the screen. Right click the bar to lock or unlock its size and position. Use your mouse wheel while hovering over an unlocked bar to change its size. Locking the bar will hide it until hovered over. Unlocked target gauges will adopt the current size of their parent bar and will cascade below it when they appear. Individual target gauges can also be moved, resized and locked independently. All gauges are updated in real time, displaying hitpoints and resource levels of their targets, along with a cast bar. Wire's OCD Addon has its own project site. Check out the details at RiftGame.com, Curse.com or RiftUI.com. Type "/ocd options" or left-click the "Cemetary" icon labeled "OCD" to open the "Options" window. The "Cemetary" icon serves as an application pin and will be visible on-screen at all times. You can drag and drop it anywhere on the screen, then lock it into place by right-clicking. "/ocd stacking" will toggle timer stacking "Up" or "Down"
Each time you open the "Options" window, your raid list will be updated automatically. Press the "Refresh" button to update the raid list manually if the window remains open. Track Planar Charges and Soulwalk timers for your raid through the "Options" window. Change the cooldown of your guild's Soulwalk by selecting "Soul Walk" from the "Raid Abilities" list and then the desired cooldown from the adjacent "Cooldowns" list. Clicking an inactive timer will activate it. Clicking an active timer will reset and deactivate it. Clicking a player's Soulwalk timer in the "Options" window will have the same effect. Click a player in the "Raid" list to view their trackable abilities in the "Player Abilities" list. This list is filtered by calling and global override. 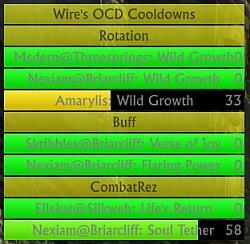 Abilities for which a cooldown timer is currently displayed are highlighted. Click an ability in the "Player Abilities" list to proactively create or retroactively dismiss a cooldown timer for that ability. Selecting an ability from the "Player Abilities" list will display a list of available cooldowns in the adjacent "Cooldowns" list. Select the desired cooldown for each player and ability from the "Cooldowns" list. This new cooldown will be applied to any non-active cooldown timer for that player. Click a genre in the "Genre" list to view a list of abilities in the adjacent "Global Override" list. Click an ability in the "Global Override" list to toggle whether it is tracked. Tracked abilities are highlighted and will display cooldown timers whenever a player in your raid uses that ability. Untracked abilities will not display cooldown timers. You cannot click on a target gauge to change your target in-game, so please don't request this. It's solely a limitation of Trion's LUA support. If Trion ever adds support to alter your targets, this will be added immediately. You'll only get a target gauge for NPC's that are actually targetted by someone in your raid. So if you pull 5 mobs and only see a target gauge for one of them, this is a limitation of Trion's LUA support. If Trion ever adds support to view all targets you're currently in combat with, this will be added immediately. Players changing their targets may change the display order of your cascading targets, if they are the only player with that target targetted. I'm considering some method to preserve the display order of cascading targets. If you lock a target gauge and another target with the same name appears, the new gauge will be drawn under the original gauge. I'm considering changing this behavior, but for the mean time I would suggest locking gauges only for unique targets, like boss mobs or singular adds. Under normal conditions, performance impact is minimal. However, multiple mobs chain casting is somewhat more CPU intensive than non-casters. You can disable cast bar displays if this becomes an issue for you. Planar Charge information is not available for anyone but yourself. This is a limitation of Trion's LUA support and will be changed in 1.6. Role information is not available for anyone outside your current group. This is a limitation of Trion's LUA support and will be changed in 1.6. There is no way to know what ablities players in your raid have available. This is a limitation of Trion's LUA support. To counteract this, communicate with your fellow raiders and proactively create cooldown timers. Non-damaging instant cast-time abilities are currently untrackable. This is a limitation of Trion's LUA support. A combat rez is currently tracked only when the target actually accepts the rez. 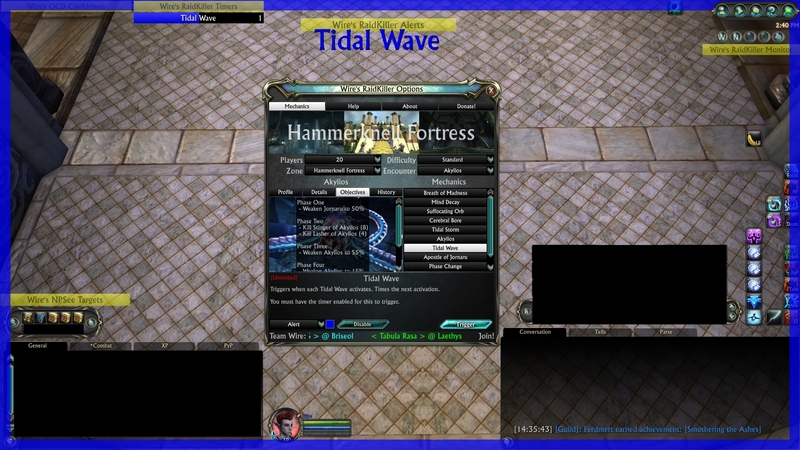 This is a limitation of Trion's LUA support with regards to instant cast-time abilities. If two players attempt to rez the same target, only the player who's rez was actually accepted will get a cooldown timer. To counteract this, communicate with your fellow raiders and use the manual override (click the missed cooldown timer to activate it). There is no way to know if a player's ability is on cooldown when they join your raid. This is a limitation of Trion's LUA support. The path should be: "< game directory >\Interface\Addons"
If you experience any errors, feel free to contact me in-game (Wire @ Byriel) or via this thread, PM or email (wire dot byriel at gmail dot com). Special thanks to Amarylis @ Byriel for help testing, timing and photographing. Casting gauges are now inside target gauges - Crazy, I know! Replaced "Touch of Greed" mechanic with "Call of Greed"
Replaced "Burn" mechanic with "Excitable Combusion"
Replaced "Molten Eruption" mechanic with "Molten Growth"
Replaced "Fire Elemental" mechanic with "Fiery Metamorphosis"
Added "Offensive" Genre - Now you can track cooldowns related to agro! Added a restart timeout so encounters no longer restart immediately upon completion - No more 1s last attempts! Removed timer for Escaped Magus - Extensive testing showed it was still random! Fixed notification errors - I blame Alsbeth! Added gradient texture to gauges, cells and cascade bars - Pretty! Timers now change color from green when empty to red when full - Bad is incoming! Checkboxes - Apparently black vs. white was too subtle? Label now displays "Enabled" vs. "Disabled"
Example: typing "/nps enable" will turn off NPSee's registration of new targets if it is "on"
You can now use NPSee in warfronts - Enjoy the OP sensation! Added "pvp" and "pet" slash commands to toggle pvp and pet displays "on" and "off"
Packaged Wire's OCD Addon - Check it out! Safe enough to say this one is dead now..
Actually no its not safe to say this is dead. Last I heard there is a team working on an update for this project. No updates have been made due to ID not being released. Any news, last i had read someone had gotten the code from the original author and was going to continually put out release updates? It is now may, 2-3 weeks after id release. I'm sorry but where is this patch of yours? Edit: It's under the OCD module and not packaged with this one. Because OCD is and was a stand alone as well and Patch files can't be added as a new mod its a contribution to an authors work not a replacement of his work. Last edited by Protonova : 02-20-12 at 09:09 PM. Updated this to include the new combat rezzes and fixed the time for an updated please contact me. Author if you have dropped this project I wouldn't mind keeping it updated need the source files for graphics as some windows will need adjusted or way to add scroll bars explained. ok am I to worry this won't be updated anymore? Just received both donations back as refunds. I love the last updates you did, thanks so much! Basically it made me get rid of the overcomplicated Kingboss addon. EDIT: Nvm about element positioning, i guess i didnt read enough of your latest update notes. Last edited by batou079 : 01-06-12 at 06:29 PM. haven't seen much talk here lately from users or author is this going to die out or there plans to continue updates? Updates will continue, I just haven't had much time lately. That and there's not too much that isn't working as far as I know. I have no way of isolating the akylios errors, as they are sporadic and nonsensical; and my guild has no attempts past P2. Mobs dying at the same time shouldn't be an issue, as it's coded to go through a list of events or process the events sequentially, depending on what the API transmits. I just don't understand why the API isn't getting various notification messages, but this is likely due to the encounter developers not understanding what message channels to use. Try turning on debug mode "/rk debug" and noncombat logging "/log" and email me a log snippet of the P2+ conversions using the latest version and I might be able to see why its not working. The same goes for any other malfunctions. Yesterday happened 3 times that we went into p3 with 7-7-6 stinger kills. There was also a try with jornaru being up in p4, but akylios was underwater, thus the addon thouht we r still in p3. On a rare occasion after a p5 try, the addon's timers r messed up badly, this happened like twice from the million tries tho(only once yesterday, the other was like weeks ago), so I have no idea what could trigger it. I think u should check that phasing redundancy again, if the emotes r correct, cuz if that would work, this couldnt happen at all. Nope, p3 isnt starting when the 4th lasher dies. We do need to kill 4 lashers + 8 stingers(sometimes we need to kill the last stinger, after the 4th lasher died). Sometimes dpsers gone wild.. and not focusing on only 1 stinger. 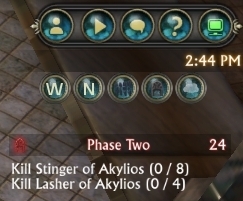 Is it possible that if 2 stinger dies in 1 sec, the addon only recognise 1 kill? Based on RiftStrats, Phase 3 does not begin until all the Phase 2 tentacles are down. So the addon just needs to watch for both 4/4 Lashers AND 8/8 Stingers down to catch the transition. Dunno how likely it is to not catch two near-simultaneous kills, but the solution for that is to kick your split DPS'ers in the arse a few times until they remember how to assist off a designated target-caller. If they don't learn, let 'em sit out a week.